While out shopping I saw a diet book titled, “Inches off! Your Tummy. The Super-Simple 5-minute Plan to Firm Up Flab & Sculpt a Flat Belly.” The author, Jorge Cruise, is not a doctor, a nurse or a nutritionist. Right away, you should be skeptical. We should all know by now that we cannot spot reduce fat, but in case someone asked me about this book, I thought I’d check it out. As I flipped through, I saw numerous excellent exercises (I counted 56) with photos and details so I purchased it for the workouts (honest!). This diet book’s premise is that you can burn 400 calories a day by doing a mere five minutes of exercises listed in his book. A line in the book states that you “could be burning up to 400 more calories a day.” It doesn’t say you will, but that it’s possible. Sorry, but that’s just impossible to do with a five minute workout. We’d all be able to eat a lot more calories if that were true. I exercise 90-120 minutes most days of the week and if his calculations are correct then I’d burn 7200-9600 calories just by working out! On the WebMD website, a person who weighs 200 pounds and runs a 12 minute mile for 5 minutes only burns 61 calories. A friend of mine just completed a 100 mile century cycling ride, which took six hours and her heart rate monitor listed her calories burned at 4400. It just amazes me at the nonsense that is out there regarding weight loss. As I read further, he does encourage other forms of exercise. He also stresses to avoid sugars, bread, pasta, desserts…get the picture now? If you’re adding a little more exercise and omitting high calories foods from your diet, then you definitely can lose a lot of weight. 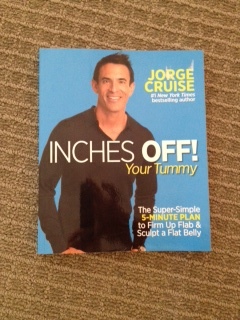 He pushes his food diet plan, which is not even mentioned on the cover. The diet he recommends is very low calorie and low carb and lists some foods that are not exactly healthy such as turkey bacon, cheese and ham which are high in salt. If you don’t eat dairy, this is isn’t good for you since different forms of dairy, mostly cheese, is on the food list two to three times a day. He also allows you to have a glass of wine every night for an after-dinner snack. Alcohol is one of the worst things to consume when attempting to lose weight! He agrees that fruit is good for you, but the only fruit on his diet plan includes a scant 2 tablespoons of blackberries on only two of the days. I’m so done with everyone thinking that fruit makes you fat. Potato chips and ice cream make you fat, not bananas! If you try his diet, you’ll probably be hungry because there’s hardly any carbohydrates. You can and should be eating a variety of quality carbohydrates from fruit, whole grains (not on the list), and vegetables such as yams, sweet potatoes, pumpkin, carrots, corn, peas, beats; and beans. He’d rather you’d stay away from those healthy foods. Ugh! It’s no wonder that he’s telling his readers that the five minutes of exercise will do the trick, because if you abide by his low carb diet, you won’t have the energy to complete any other tasks. Per the textbook Practical Applications in Sports Nutrition, “…restricting carbohydrates from an athlete’s diet is tantamount to performance suicide.” (p. 82). You don’t have to be an athlete in order to justify consuming carbs. Even if you don’t exercise, if you drastically cut back on healthy carbohydrates, you’re going to be hungry, tired, grumpy and malnourished. Don’t waste your money on this book unless you want to buy it for the exercises. I give it a thumbs-down.